There is a common misunderstanding that there exists a law that if you are legally justified in using your gun that you can’t be sued. This is just not the case. First, if a person has the filing fee, anyone can sue anyone else in the State of Texas. There is no one stopping anyone else from filing a lawsuit. Winning a lawsuit is a different issue entirely. If someone files the lawsuit, no matter how frivolous, it still must be dealt with, and it still must be shown to the court that this or that defense bars this lawsuit. This process can take significant time, money, and legal energy even for the most loser of cases. In short, lawyers get paid and even if you beat the “rap,” you still have to take the civil “ride.” So, if there is no immunity to lawsuits for gun owners, what protection is there? A defendant who uses force or deadly force that is justified under Chapter 9, Penal Code, is immune from civil liability for personal injury or death that results from the defendant’s use of force or deadly force, as applicable. This section provides that a person who uses force or deadly force that is justified under Chapter 9 of the Texas Penal Code is immune from civil liability for personal injury or death that results from the defendant’s use of force or deadly force, as applicable. This statute does not prevent lawsuits; it just makes the ones filed harder to win. Immunity from liability is an affirmative defense, and, as such, this defense will be considered only after a plaintiff is well into the pain a civil suit may cause an innocent defendant. Texas courts have ruled that immunity from suit would be a violation of the “Open Courts Doctrine” of Article 1, § 13 of the Texas Constitution. A Texas intermediate appellate court ruled in In re Smith that section 83.001 does not mean immunity from suit. In re Smith, 262 S.W.3d 463 (Tex.App.—Beaumont 2008), it means immunity from damages if the defense is proven during the case. If you “use” a firearm or any legal weapon in Texas under the Texas Law Shield Firearms Legal Defense Program, program attorneys will represent you in any legal proceeding (criminal or civil), for zero additional attorneys’ fees. This includes all criminal charges arising from a “use” of a gun or any legal weapon. Family Armory customers can save a little money when signing up with Texas Law Shield when using promo code “FAIR” at checkout. Why Should You Attend A Gun Law Seminar? 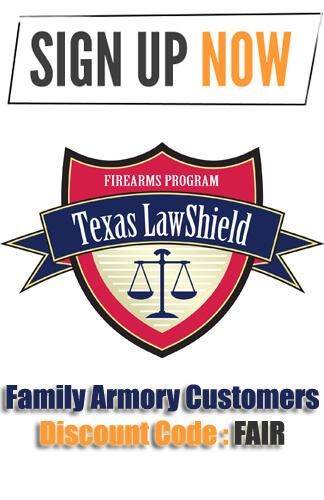 Family Armory is proud to host Gun Law Seminars by Texas Lawshield. Because ignorance of the law is not a legal defense, it is your responsibility to know the law as it pertains to firearms in our state. The fact is that if you are a legal gun owner and are forced to defend yourself, the legal system can be hostile – even if you did nothing wrong. Attending a gun law seminar exposes students to experienced attorneys and members of law enforcement that are seasoned in firearms, firearm law, and in staying legal. Their job is to separate legal fact from fiction and give you the information you need as a gun owner to protect your family.